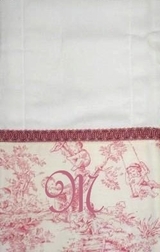 Monogrammed Burp Cloths Custom Made in Various Toile Fabrics. 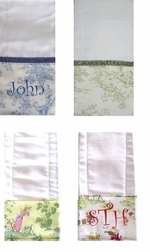 Home > Babies & Infants > Bibs & Burp Cloths > Monogrammable Burp Cloths Custom Made in Various Toile Fabrics. We are so thrilled with how these monogrammable burp cloths look! The burp cloth starts with a 100% cotton, thick, absorbant, cloth diaper. We then trim the entire bottom of one end with 4.5 inches of your choice of toile fabric. The burp cloth is completed with a sweet ribbon or embroidered fabric trim. The cloths shown here are in various colors of Central Park Toile. They look lovely monogrammed, and make wonderful baby gifts, shower gifts.